Going to college is about gaining useful knowledge and skills that will help you in your professional life as well as your personal life. College is a great time to develop good financial habits as well! 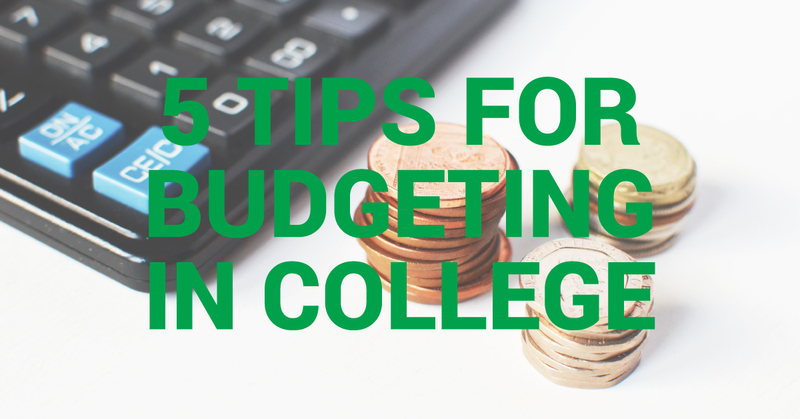 Getting started is half the battle, but these 5 tips for budgeting in college will help you get started on the foot! Write everything down. You’ll be amazed at what you spend and where you spend it if you can see it on paper. Write down everything you spend in a month and break it out into categories. This will help you identify where you can cut back. It’s common to feel that your budget is stretched to its max, but you’ll never truly know why you’re spread thin until you itemize how you’re spending. Try the envelope method. This is a popular method for budgeting in college. Why? Because it works! Plan out your monthly, weekly, or per pay period budget by listing how much you plan on spending for miscellaneous expenses such as groceries, gas, and splurge items. Next, label envelopes for each budget item with the exact amount you want to spend during a set time period (example: groceries: $200 per week). Place the money in a labeled envelope and pay for those expenses ONLY out of that envelope. It’s much easier to keep from overspending when you physically see how much cash you have left. This is the kind of forced discipline that will help you create better financial habits after college. Leverage student discounts. Many colleges and universities have partnerships in place where students receive discounts at local shops and restaurants. AmeriTech College is no exception. Not using these discounts to your advantage is like throwing your money away. Leverage it to the fullest! Ask what discounts agreements your college has in place. If discounts aren’t currently offered at your favorite shopping or food spots, see if your student services team can secure an agreement. It never hurts to ask! Avoid credit cards. This isn’t always easy to do (especially during the holidays), but remember that credit cards carry extremely high interest rates. One trick to fight the impulse to charge is to consider the extra hours you’ll have to work to pay off the debt. Perhaps the splurge isn’t worth the extra shift you may have to work to pay off the charges and interest. You can also try saving in advance for a “splurge fund” so you can treat yourself without accumulating avoidable debt. With a little effort and discipline, you’ll develop habits that will pay off in the future. Happy budgeting!